One of South Florida’s fastest growing areas, Brickell/Downtown Miami offers residents and tourists an infinite array of both business centers and leisure activities. Surrounded by the Miami River, the area is easily distinguished by its looming skyscrapers that together create the majestic Miami skyline. The skyline’s silhouette is complemented by a surplus of department stores, fine dining establishments, lavish hotels and trendy art galleries. In particular, the view from the outdoor bar at the height defying Four Seasons Hotel is worth a look and a cocktail. These same skyscrapers, that house both luxury condominiums and headquarters of major multi-national corporations, play a critical role of providing employment to over 104,000 people on a daily basis. This area alone comprises over 18 million square feet of office and retail space. 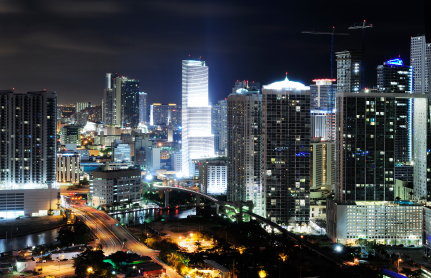 If the hustle and bustle of the Downtown Miami scene gives the allusion of all work and no play, do not be mistaken. The city plays just as hard as it works. Downtown’s nightlife stays alive well after happy hour, being sure to keep party hoppers satisfied with a wide assortment of hip lounges and clubs. The development of Mary Brickell Village has become a destination for residents of this area in particular for food, drinks and fun. The recent additions of famed New York City restaurant Rosa Mexicana and seafood specialist Oceannaire have begun to pull customers from all across the city to this urban oasis. Varied cuisine from Tapas to Asian can be had within walking distance. Bragging rights for the oldest bar and club in the area go to Tobacco Road, a joint for a cold beer, some terrific bar food and great live music. Brickell is a potent cocktail mixture of old and new Miami. Our urban center also holds its own share of cultural experiences. One of Miami’s key attractions amongst visitors is the Port of Miami, located in the Downtown area, which serves more than 3 million passengers per year and constitutes the number one cruise port in the world. Guests and residents alike enjoy the stimulating cultural experiences offered by the likes of the Miami Children’s Museum, the James L. Knight Center, the Miami Art Museum, Parrot Jungle Island and the Carnival Center for the Performing Arts. For the avid sports lover, visit the American Airlines Arena, home to the beloved Miami Heat basketball team. The arena is located next to Bayside Marketplace, a 20-acre waterfront retail complex that has become one of South Florida’s number one tourist destinations.